The Cowan Report: If The Tory Party Don’t Trust Their Candidate Then Why Should Londoners? If The Tory Party Don’t Trust Their Candidate Then Why Should Londoners? Mr. Alexander Boris de Pfeffel Johnson, the Conservative Party Candidate to become the Mayor of London, has now pulled out of a total of four hustings. On the latest occasion he has backed away from debating London’s future at an event arranged by Time Out magazine. Prior to that he failed to appear on Jonathan Dimbleby’s Any Questions. The famously gaffe-prone Tory MP for Henley-on-Thames is clearly being kept away from the public which – at the very least - raises the question what is the Conservative Party High Command frightened of? Those that support Ken and those that don’t all have one thing in common. They know that he has a vision for London and what it is. In fact, I think most will know that he pioneered the introduction of the ward-specific Safer Neighbourhood Police Teams; he is promising to invest much more in crime fighting and extra police and that the Capital now has more police officers on the beat than any time in its history. Most Londoners will know that Mr. Livingstone has radically improved bus services, has secured the essential £16billion investment for Crossrail and helped bring the Olympics back to Britain. They will be aware that he has ground-breaking environmental policies and has won endorsements from leading green campaigners and politicians. Above all, they can sit down and figure out if those are policies they think will benefit the Capital and build London’s prosperity well into the next century. Contrast that with the Conservative’s plan of hoping Londoners will somehow sleepwalk into electing a Tory Mayor. 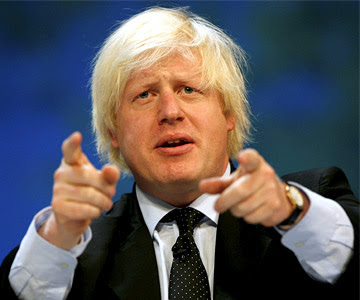 Surely, if the Conservatives have confidence in Mr. Johnson then they should let voters see him for what he really is? I think that it’s similar to buying a car or an insurance policy. You need a check out the details before you commit yourself to living with your decision. But, in this case the Tories are being more than a little cagey in letting use know about what exactly it is they’re trying to sell us.